Group racing was the theme of the day during Friday’s C1 races at the 2017 KMC Cross Fest. In the Men’s race Friday evening, it was no different. 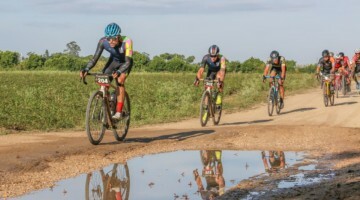 As many as nine riders joined the lead group and seven finished near each other on the finishing stretch on the Thompson Motorsports Speedway. Tobin Ortenblad (Santa Cruz / Donkey Label Racing) continued his hot start to the season by rising to the top of the large group at the front of the race. Spencer Petrov (Aspire Racing) continued his impressive early season by finishing second and Jack Kisseberth (JAM Fund / NCC) took third. Stephen Hyde (Cannondale p/b Cyclocrossworld.com) and Kerry Werner (Kona) rounded out the top five. Full results from Connecticut are below. Definitely looking forward to breakdown to understand how the final lap played out. No offense to Petrov or Kisseberth, but they usually wouldn’t find the podium at a C1.